TOKYO — Fuji Heavy Industries, the maker of Subaru vehicles, reported a 24 percent decline in operating profit in the latest quarter as the company booked big hits from unfavorable foreign exchange rates and the spiraling costs of recalling defective Takata airbags. Operating income at dropped to 101.54 billion yen ($989.96 million) for the fiscal first quarter ended June 30, Executive Vice President Mitsuru Takahashi said today. Net income declined 6.3 percent to 78.87 billion yen ($768.9 million). Revenue inched ahead 0.5 percent to 769.38 billion yen ($7.50 billion) in the April-June period, while global sales increased 8.9 percent to 245,000 vehicles. Fuji Heavy’s falling profits in the first quarter break a string of stellar earnings. In the fiscal year ended March 31, the Japanese company chalked its third-straight year of record financial results on booming U.S. sales and big gains from favorable foreign currency rates. But the yen has since reversed course, strengthening against other currencies after a period of weakness. And like other Japanese automakers, Fuji Heavy is being hammered by the yen’s appreciation. The more expensive yen erodes the profits the automakers make on vehicles sold overseas. For Subaru, the Japanese currency climbed 7.5 percent in value against the U.S. dollar in the first quarter, compared with a year earlier. Swinging currencies lopped 29.2 billion yen ($284.7 million) off Fuji Heavy’s operating profit. A 28.3 billion yen ($275.9 million) hit came from the yen’s surge against the dollar. Spiraling costs to recall vehicles equipped with faulty Takata airbag inflators also dragged down quarterly operating profit. Fuji Heavy took a 25.6 billion yen ($249.6 million) charge. The defective inflators, which can be prone to explode when exposed for long periods to heat and humidity, are part of one of history’s biggest automotive callbacks, affecting millions of vehicles worldwide and almost every major auto manufacturer. Subaru aims to recall more than 2 million vehicles this year, just part of the 3.6 million it reckons it needs to recall to address the problem, Takahashi said. North America, which accounted for about 69 percent of Subaru’s global sales, saw its regional operating profit decline, mostly on the back of foreign exchange losses, Takahashi said. Regional operating profit decreased 9.8 percent to 24.0 billion yen ($234 million). North American sales, however, remained robust, climbing 11 percent to 170,000 units. “The sales trend remains strong, so we are not too concerned,” Takahashi said about the backsliding profit in the company’s biggest market. 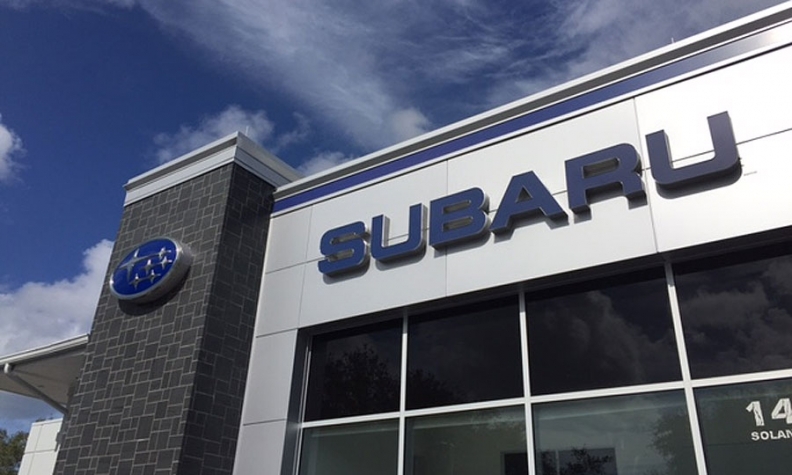 Average transaction prices for Subaru in the U.S. dipped 1.4 percent in June, and were flat for the first six months of the year, according to Kelley Blue Book data. That compares with an industry average increase of 0.9 percent in June and a gain of 2.8 percent for the first half-year. That compares with an industry average increase of 0.9 percent in June and a gain of 2.8 percent for the first half-year. Takahashi said Subaru’s incentives in the U.S. are still far below the industry average, but noted that increasing outlays by competitors are stoking pressure across the board. Subaru’s average incentive spending is around $600 a vehicle this year, nearly unchanged from last year. That compares with an industry average that has grown by $500 or $600 since last year to the $3,000 to $3,100 range, he said. “Although we don't intend to raise the amount of our incentives up to the industry average, I'd have to say the gap has grown wide to the level we can't overlook,” Takahashi said. “We'd like to put in place an incentive structure that has an appropriate variance [from the industry average]." European sales increased 6.3 percent to 11,000 in the quarter. Fuji Heavy did not detail regional operating profit for Europe. Citing higher Takata recall costs and the worsening foreign exchange rate environment, Fuji Heavy lowered its forecast for the current fiscal year ending March 31, 2017. The company now expects full-year operating profit to slump 29 percent to 400 billion yen ($3.90 billion), from last year’s 565.6 billion yen ($5.51 billion). In May it had forecast a more moderate decline to 420 billion yen ($4.09 billion). Net income, meanwhile, is seen declining 35 percent to 285 billion yen ($2.78 billion), from 436.7 billion yen ($4.26 billion) last year. It had earlier predicted net income would fall only to 293 billion yen ($2.86 billion). Fuji Heavy kept its units sales forecast unchanged. It predicts worldwide sales will increase 9.6 percent to 1.05 million vehicles.